I love Canada this time of year - the crisp air, fall colours, and seasonal vegetables. 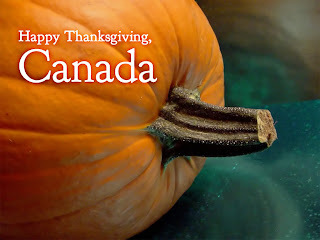 Mainly, I miss the pumpkin pie and Thanksgiving tie-in coffee drinks at the Second Cup (the Canadian version of Starbucks). Oooh...white hot chocolate at Second Cup....Sigh. Oh, wow! You use REAL pumpkin and not the canned kind? I've only ever used canned stuff. I just might have to make the real stuff - if I can find a decent pumpkin!